Ignore the white bits - I need to raid my wardrobe for some grey! This rag rug is something I have had in my mind to do for a long time. I’ve loved rag rugs since catching sight on one at the Black Country Museum as a kid. 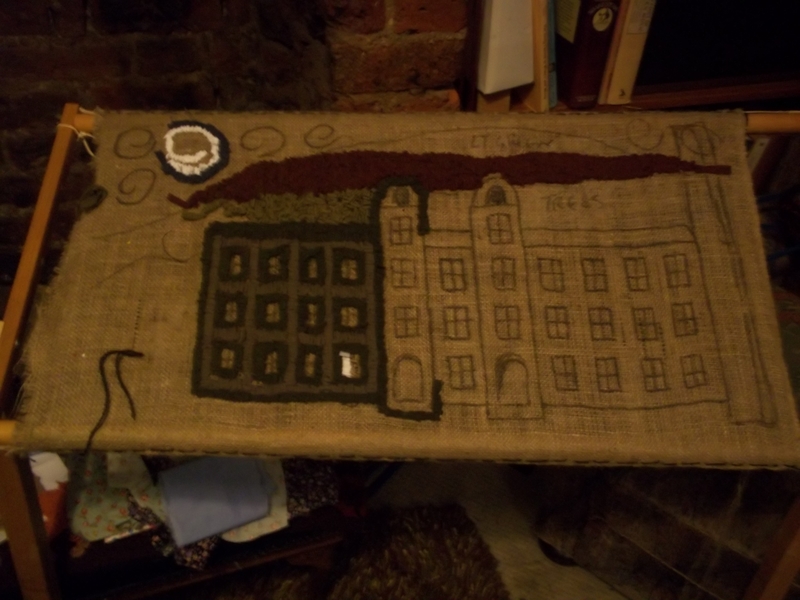 Seeing the fantastic exhibition of rag rugs at the Bradford Industrial Museum and those on display at Beamish more recently, has spurred me on. 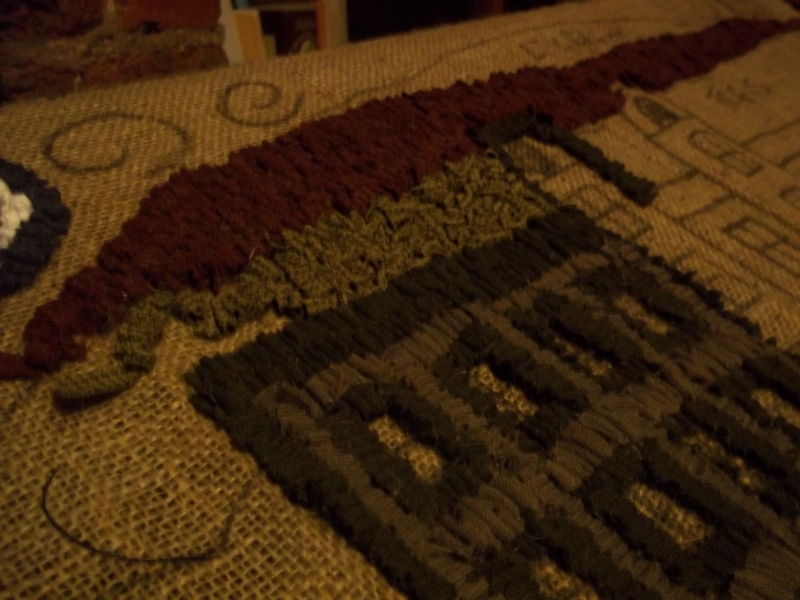 I found myself with loads of hessian having brought too much by accident, and last week I got in touch with the Shades of Heather workshops for the special type of hook you need. The gentleman I talked to said it would take a few days because he hadn’t made any for a while – it came much sooner than I thought and is a thing of beauty in itself. There are basically two types of rag rug. For a proddy or proggy rug you poke oblongs or ‘clips’ of fabric into a backing, creating a thick, mottled pile. These clips used to be measured out using matchboxes as templates, apparently! I’ve got an antique one of these that I came across at an auction. I got it for virtually nothing but it took a fair bit of tlc to be able to unroll it without a respirator – I’d take a photograph of it but it is looking rather indignant under a scatter of wool fibres at the mo! The type of rag rug I’ve attempted is called a hooky mat; longer strips of fabric are pulled up through the backing in small loops. For those of you that don’t know Saltaire, the colossal mill here has as its backdrop what used to be called Hope Hill. Between bands of fields and woodland there is currently the most amazing burgundy stripe of moorland running across it. Alas, even though it is part of Saltaire’s buffer zone as a World Heritage Site, Bradford Council seem keen to smother it with houses, and the new ‘Heritage View’ estate is currently underway – so it’s nice to enjoy it while we can! 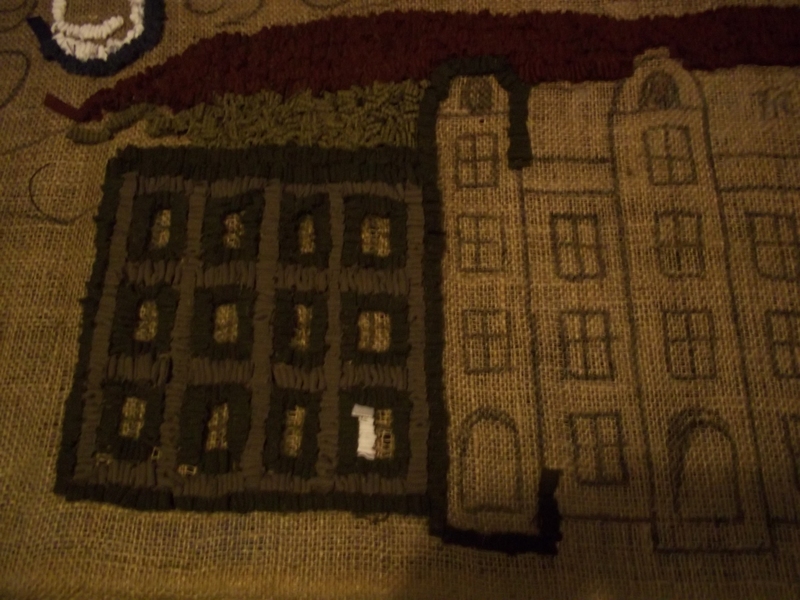 Next > Salts mill hooky mat finished!